Crown Media’s two Hallmark cable channels are emphasizing their focus on holidays all year long and the family-friendly attributes of their programming in their pitches to advertisers this upfront season. Crown Media’s emphasis on holidays stems from the success of Hallmark Channel’s annual “Countdown to Christmas” lineup of holiday-themed movies and specials airing each year since 2011 in November and December. Hallmark’s Christmas programming has made it “the highest-rated network on television during the holidays,” said Ed Georger, executive vice president of advertising sales for Crown Media Family Networks. The company consists of Hallmark Channel and a spinoff network, Hallmark Movies & Mysteries. Georger and Crown Media President and CEO Bill Abbott made their company’s pitch to ad agency reps, media buyers and members of the press Wednesday evening in Manhattan at the Rainbow Room, the swank event space at the top of 30 Rockefeller Plaza. While Crown Media’s guests dined on filet mignon and roasted black cod with miso glaze, the two explained how Hallmark’s emphasis on the Christmas holiday season led to the company adopting a programming strategy based on other holidays and seasons throughout the year. “In November and December, ‘Countdown to Christmas’ delivers more seasonal content and reaches more viewers than any other network, 24 hours a day, seven days a week, highlighted by 18 new original movies,” Georger said. “Coming off of fourth quarter and our highly rated programming, we continue to build franchises and events that sync up with the Hallmark brand and the retail calendar,” Abbott said. “Rather than relying on one hit show or one franchise, we have created a 365-day experience with every one of our programming events driving viewership and establishing Hallmark Channel as a year-round destination for celebrations. This is a long-term strategy designed to create a year-round environment full of unique opportunities for advertisers,” he said. 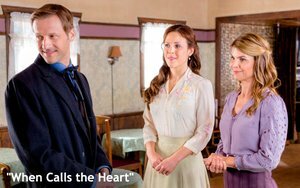 Each of Hallmark’s seasonal segments features one or more of the network’s original series and made-for-TV movies. For example, this year’s “Spring Fling” will usher in the third season of the 19th-century western drama “When Calls the Heart” and the second season of “Good Witch,” starring Catherine Bell in the title role. A new series, “Chesapeake Shores,” is set to premiere in Hallmark’s “Summer Nights” franchise this summer. But besides segmenting its broadcast calendar according to seasons and holidays, much of Crown Media’s presentation for both of its networks for this year’s upfront focuses on family. One of the networks’ stars, Lori Loughlin, made this point clear at the beginning of the presentation Wednesday night. Loughlin, formerly the star of “Full House,” is now seen in “When Calls the Heart” on Hallmark and in a mystery series called “Garage Sale Mystery” on Hallmark Movies & Mysteries. Loughlin and other Hallmark stars and personalities who came on-stage to address the group of advertising types gathered in the Rainbow Room all invoked the word “family” in describing what it was like to work on Hallmark shows and TV movies. One of them, James Denton, now starring in “Good Witch,” warmed up the crowd by talking about his own career in ad sales – before he became an actor. “I probably owe my career to people just like you,” Denton said. “I sold newspaper ad space, I sold AM radio, then FM radio. I sold local CBS affiliates. My skin was so thick at the end of all that that auditioning was a piece of cake. … So I owe it all to people just like you. At the end of the presentation, Georger summed up Hallmark’s pitch. “In this year’s upfront,” he said, “we urge you to recognize that your investment in Hallmark Channel consistently delivers and provides value for your brands. We’re excited to work with you in the coming year to create new opportunities that will continue to drive business. “With the legacy of the Hallmark brand, top-quality family entertainment, and audience growth against both our distinctive channels, Crown Media Family Networks offers one of the most unique value propositions in all of cable,” Georger said as the presentation portion of the evening came to a close.